It was St. Patrick’s Day, March 17, 2018, a mother of three boys vanished into thin air in Longmont, Colorado. Rita Gutierrez-Garcia went out to celebrate with friends and family in the evening. The group went bar hopping to the Speakeasy located at 301 West Main Street and the Breaker’s Grill located at 380 Main Street. Rita was last seen in an alley behind 3’s bar talking on her phone at approximately 2:30 a.m.
Deputy Chief Jeff Satur of Longmont Police Department said Rita was overheard telling someone on the phone she would get a ride from “someone else.” Authorities also say there were as many as seven or eight potential witnesses behind the bar that evening. Rita is a mother of three young boys, ages 9, 13, and 18, and described by family as a bubbly and busy mom, who is just one college semester away from becoming a paralegal. Something she has worked very hard for. Police have asked for anyone who may have seen Rita that evening, to call them immediately. Longmont Police Department was investigating the possible connection between a young man found with head trauma and the disappearance of Rita. Tyler Bullock was found at the same location eight days after Rita disappeared, at approximately 2:30 a.m.
Tyler Bullock was found unconscious five days after Rita Gutierrez-Garcia’s disappearance in the same area. According to Tyler’s sister Kristal Beecher, Tyler was in the intensive care unit for head trauma due to bleeding on his brain. Tyler was found behind the bar unresponsive due to serious head injuries. He is now recovering. “There is zero connection. I just need to stress there are no suspects in my case. It’s really just a matter of the specific block in Longmont needing better security systems, more cops on busy nights, and cameras, maybe undercovers,” said Tyler, still recovering from the traumatic experience. 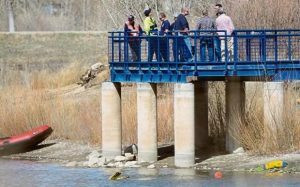 On March 24, 2018, Longmont Police divers searched a pond at Golden Ponds Parks southwest of Hover Street and Third Avenue but did not find anything. Golden Ponds is a network of ponds and walking paths. Police, Longmont Emergency Unit, and Longmont Fire Department searched from approximately 9 a.m. to 4 p.m. Canines were also used in the search. Police divers searching area of Golden Ponds in Longmont, Colorado. Courtesy of Daily Camera. Police have been working long hours in the search for Rita, and rotating staff to ensure fresh eyes are involved in the investigation. Prior to Rita’s disappearance, she was very active on Snapchat but has not posted since her disappearance. This worries her family. Diane Romero and Jessica Romero please for the public’s help in the search for Rita Gutierrez-Garcia. “I love you,” said Rita’s mother Diane Romero at a press conference organized by Longmont Police Department on March 22, 2018. Holding a picture of her daughter, “I need you here,” she said. Rita’s sister Jessica Romero tearfully told reporters, “She’s my older sister and I’ve never had to go a day without her in my entire life,” said Romero. 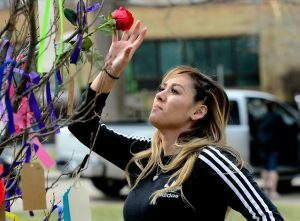 Family and friends of Rita held a prayer vigil on March 25th at Longmont’s Thompson Park. There, they offered comfort to each other and covered a tree with ribbons of different colors and cards with prayers for her safe return. Pastor Choutka, the pastor at the Rocky Mountain Christian Church’s Niwot campus, asked people attending the vigil to gather around the family, asking God to give Rita’s mother strength and help the investigators. “By the powerful name of Jesus, we do ask for a miracle, that she be found safe and sound,” Choutka said to those who gathered at the park to pray. Rumors and speculation of what happened to Rita have circulated and the family is trying to protect the young boys and cousins. “We are trying to keep them strong,” Diane Romero said. Rita was last seen wearing a black long-sleeved shirt with black leggings. She has tattoos on both arms, as well as on her shoulder and on her feet. Sleeve tattoo with eye and wave design on Rita Gutierrez-Garcia’s arm. 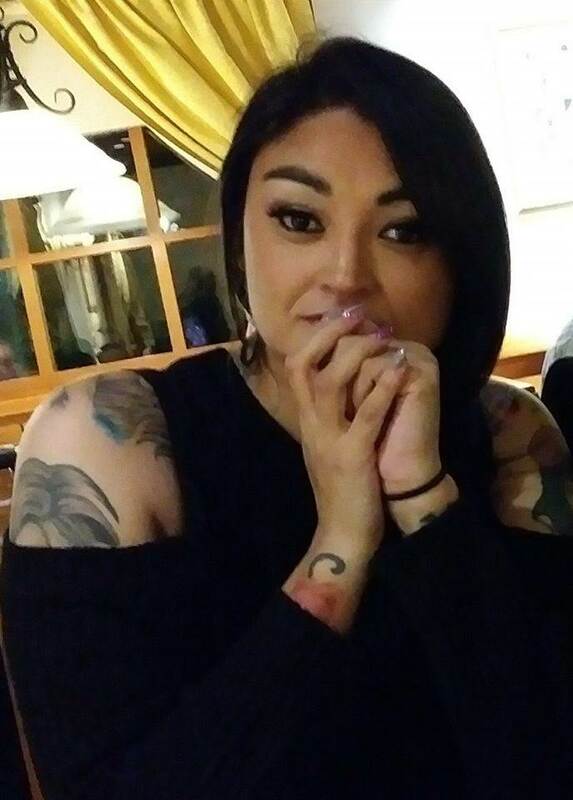 Anyone with information about the disappearance of Rita Gutierrez-Garcia should contact the Longmont Police Department 303-651-8501.